[Pamphlet; Constitution de l'an X; Napoleon] Sénatus-Consulte, Organique de la Constitution. Extrait des Registres des Délibérations du Conseil d'Etat." 15pp., 8vo, disbound, foxing, edges frayed, small stain on last page, front grubby, text complete and clear. 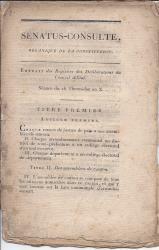 WorldCat only mentions the Bibliothèque Nationale copy. 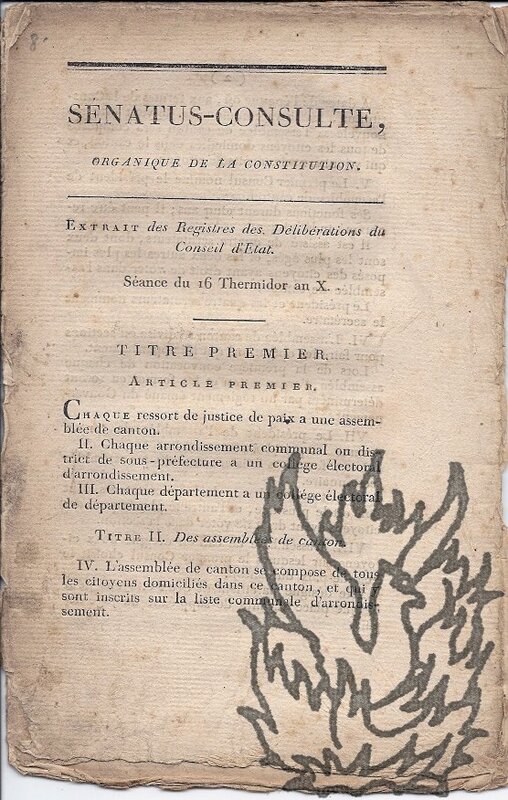 This is the "famous" 'Constitution de l'an X' by which Napoleon obtained virtually dictatorial powers. Twelve Typed Letters Signed to the Secretary, Royal Society of Arts. English electrical engineer and research scientist and writer (1886-1979), Member of the Senate, University of London. All items one page, quarto. All but one very good; one item discoloured and creased at head, and with several closed tears. All signed 'P Dunsheath' and most docketed or bearing the Society's stamp. The letters concern a lecture at the Society Dunsheath agreed to give following a conversation with Sir George Sutton entitled 'Science in the Cable Industry'. Dunsheath suggests that L. B.